The next leg of our Rajasthani tour took us from Udaipur to Jodphur. 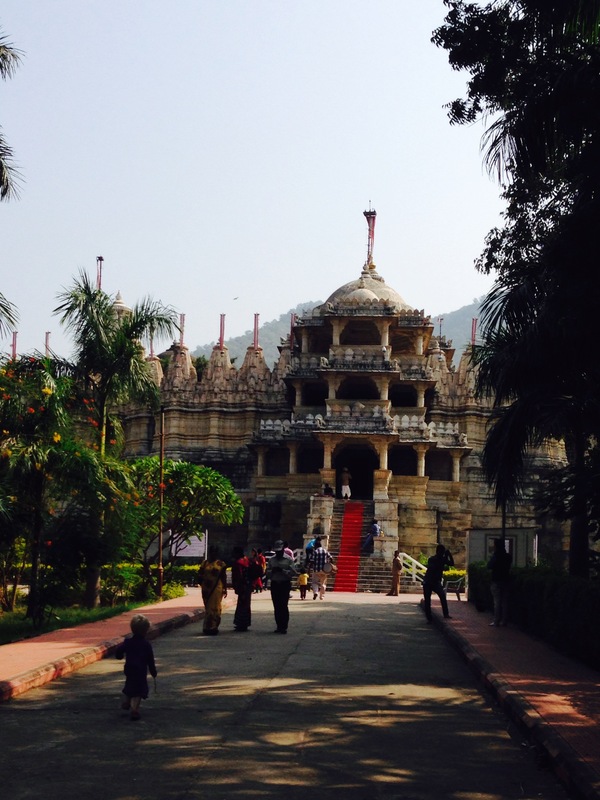 The winding mountain roads led us first to the oldest Jain temple in India at Ranakpur. The buildings were beautiful and it was a good opportunity for the boys to run around looking for wildlife including a sunbathing lizard and the resident monkeys. Unfortunately our timing was poor and our visit coincided with prayer time so we were unable to see inside the temples. Later in the day we got caught up in a diversion as the main road to Jodphur was closed for a festival. A comedy of errors ensued that saw a tractor crash into a Rickshaw, and the car in front get stuck in the sand until the driver turfed all his passengers out to lighten the load. 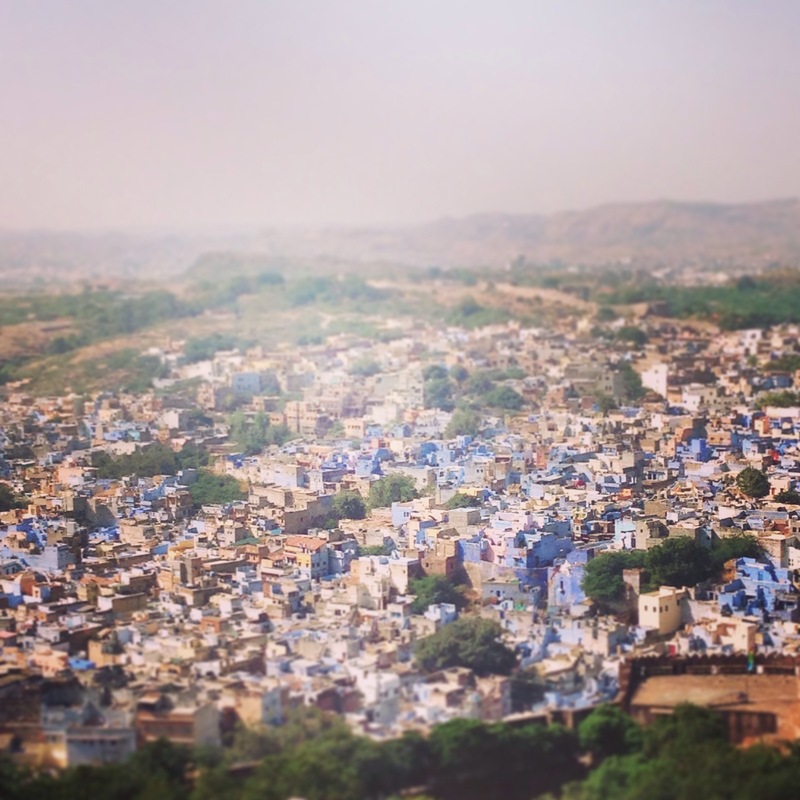 Jodphur’s Mehrangarh fort was the definite highlight of our time in the blue city. The boys were tired and cranky but they soon got into the swing of things climbing over cannons and checking out the impressive weaponry on display. The fort also afforded us with stunning views over the city’s skyline. On the road to Jaisalmer we passed through sparse scrubland along the edge of the desert. As we sped through the rural landscape the boys pointed out the occasional herd of sheep or cattle and working camels pulling carts. Whilst N and I marvelled at women in beautiful coloured sarees and tractors all bearing improbably heavy loads. 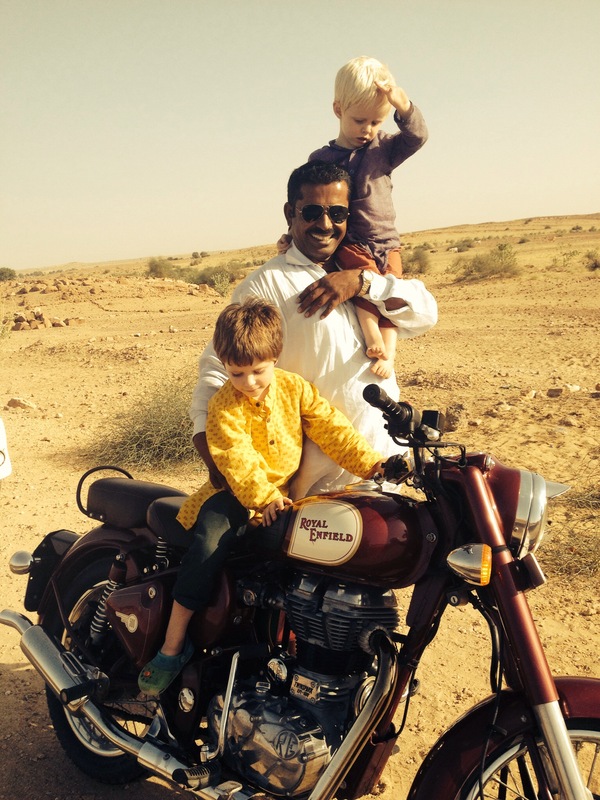 Jaisalmer was welcomingly quiet after the noise and bustle of Jodphur. We visited the impressive sandstone fort and several beautiful Havelis but really we were just going through the motions to pass the time to our much anticipated camel safari. As we headed to the meeting point we met charismatic Rhoza Khan, owner of our camel trek company. With his pukka Ray Bans and perfect teeth it was like he’d ridden his Royal Enfield motorbike off a movie set. Having admired his bike Rhoza invited N for a spin and they sped off down the road. We caught them up in the car and the boys took it in turns to go for a ride (whilst I had my heart in my mouth!). We eventually pulled up to the meeting point and were met by Amil, our camel man. 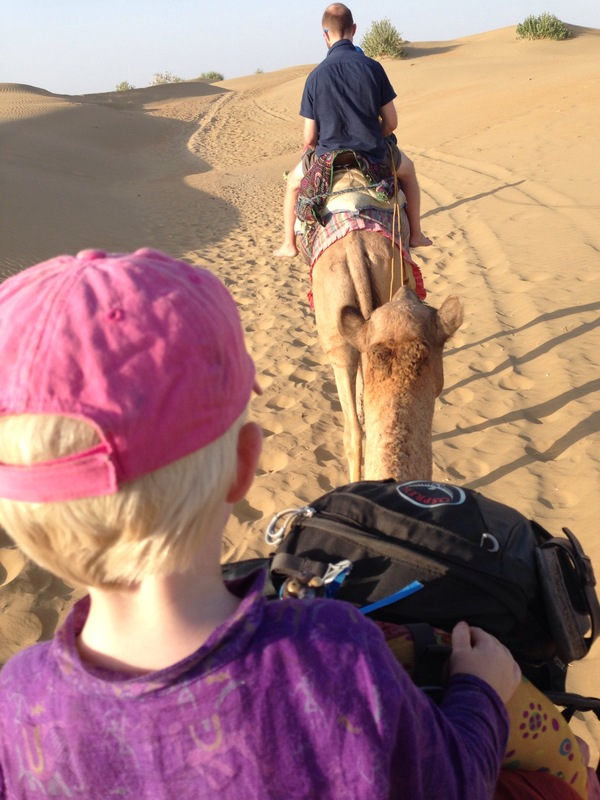 After ensuring we had sufficient water we got onto our camels (named by the boys as Andy and Twinkle) and headed off towards the dunes. As we made our way into the dunes we paused at a small village to procure a chicken for dinner. Much amusement ensued as several men and children chased the chicken around before it’s capture. We plodded along taking in the scenery and as the movement of the camel took its toll on my undercarriage I hoped we weren’t going far. Happily we soon stopped to set up camp. And as the sun set the boys played together, sliding down sand dunes, finding sand beetles, and writing in the sand. Nick and I relaxed and enjoyed the happiness of our offspring. The moon rose and we sat around the campfire, drinking chai. Amil made a delicious dinner from said chicken which the boys witnessed being dispatched to the giant coop in the sky. 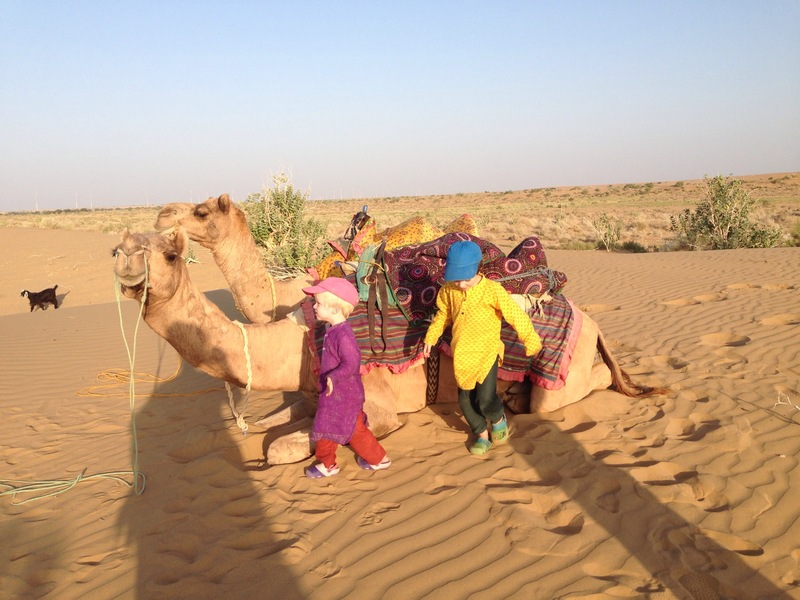 Rhoza brought his children out to the desert to meet us in his large swanky 4×4. Bearing biscuits and juice for the boys to fuel their sand dune adventures. With happy hearts we eventually drifted off to sleep under the stars. 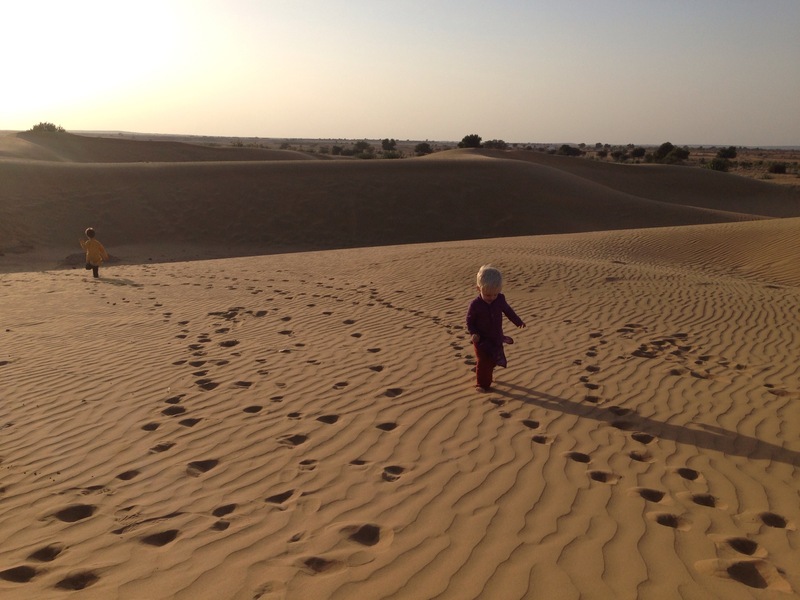 We woke early and watched sunrise over the Thar Desert. G made us all laugh by saying “We’re real explorers now, aren’t we Dad?!”. Amil made more chai and we packed up camp before Andy and Twinkle took us back to the roadside meeting point. We spent the next day chilling at the hotel pool getting some much needed downtime. Then it was back on the road for quick overnight stop in Bikener and after yet another Rajasthani fort we hit the road for the long drive to Amritsar. Sounds amazing! Bless George – he is definitely a real explorer! He definitely is since trekking!